The Treshnish Isles are currently designated as a Site of Special Scientific Interest and are a Special Protection Area under the EC Directive on the Conservation of Wild Birds. The islands provide a breeding habitat for nationally important concentrations of seabirds. At the Harp Rock on the island of Lunga, these are particularly spectacular because dense aggregations of guillemots can be viewed across a narrow but precipitous ravine providing a singular view of a seabird colony. Approximately 47 differnt species of birds can be spotted, including razorbills, guillemots, fulmars, storm petrels, kittiwakes, herring gulls, and shags - as well of course the large population of puffins! 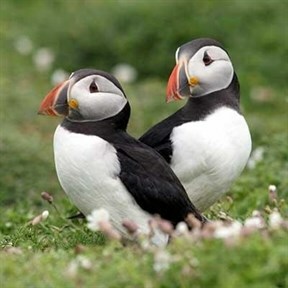 The best time to see the puffins in the Treshnish Isles is from mid April until early August. These comical birds have little fear of humans and its possible to get very close to them. Amongst the fallen rocks on the fossil beaches there are internationally important concentrations of breeding storm petrels. These birds, which are the size of swallows, are highly secretive and, to avoid being eaten by gulls, they only come ashore at night from the deep ocean where they feed. During winter, the islands provide valuable grazing for barnacle geese and, in the Autumn, the beaches are breeding habitat for nationally important populations of Atlantic grey seals, which give birth to their white pups along their shores. In early summer it is also possible to hear the rasping call of the corncrake on Lunga.